The report of the “Apostolic Visitation,” issued by the Vatican congregation that oversees religious orders, also offers a helpful snapshot of the challenges that most women’s religious communities in this country face: declining vocations; dwindling financial resources thanks to sisters historically being “undercompensated,” as the report states; and difficulties in finding women of sufficient youth for leadership roles in their congregations. As such, it is a document that will most likely be welcomed by many of the women religious who are heroes to American Catholics. The report is noticeable mainly for what it does not do. It does not issue blanket condemnations. It does not set out a list of new rules for women’s religious orders in the United States. It does not ask them to abandon their work in social justice. It does not condemn feminism—a topic explicitly mentioned early on as one of the motivating factors for the investigation—indeed, the word is not even mentioned. It does not call for any action by religious orders, except in the most general of terms, and when it does so it encourages the actions that all religious orders are encouraged to do: pray more, reflect on ways to increase vocations, consider their relations with the hierarchical church. It does not place them in receivership as has been done, in essence, with the LCWR. Mainly, it does not criticize American sisters, but praises them. The document is a general, and generally positive, overview of what spiritual writers call the “lights and shadows” in women’s religious orders today. When the Apostolic Visitation was announced in 2008, many American sisters expressed a profound sense of dismay and demoralization as a result. Such a Visitation was, as the final report admits, “nearly unprecedented.” Normally such visitations--usually carried out by a local bishop, and not Vatican congregations—come in response to a serious scandal or malfeasance. While the report says that visitations are “normal,” this refers more to the internal visitations, that is, a religious superior visiting her own community. In short, a Vatican Visitation is usually reserved for a grave event. Vocations were on the decline, as everyone knew, but was this the reason for the Visitation? The genesis for the Visitation, then, seemed mysterious, which frustrated many sisters with whom I spoke at the time. (Mother Mary Clare Millea, ASCJ, the “Visitator” admits this in an interview with Walsh, RSM, in America, published today.) In time its origins became clearer. The next year, in 2009, Cardinal Rodé repeated his critique: “Above all, you could speak of a certain secularist mentality that has spread among these religious families, perhaps even a certain ‘feminist’ spirit.” Not long afterwards, the Congregation for the Doctrine of the Faith announced a separate investigation of the Leadership Conference for Women Religious, which represents the majority of the women’s congregations in this country. Women religious in this country, not surprisingly, felt beleaguered. But in time the sisters’ fears seemed to lessen, especially after the appointment of Archbishop Joseph Tobin as the secretary of the Congregation in 2010. Early on, Archbishop Tobin, himself a former superior general of his own religious order, the Redemptorists, took a more pastoral tone, calling for “justice and charity” in the Visitation. Archbishop Tobin later left the Congregation after being named archbishop of Indianapolis. Two years later, in 2011, many US sisters welcomed the appointment of a new prefect, Cardinal João Braz de Aviz, in who said the (separate) investigation of the LCWR caused him “great pain.” Cardinal Aviz also said that his main aim in his role was to “rebuild trust” and “listen again.” Many sisters with whom I spoke thought these remarks might betoken a gentler approach to the investigation. They were correct. Women religious as well as their colleagues and friends will find in the report a fair depiction of the state of Catholic sisters in the United States. They are aging, usually in their 70s, with declining vocations, but have a “strong sense” of the history of their foundresses and founders, and they “draw strength” from the examples of their courageous early members. Catholic sisters are intensifying efforts to work with lay colleagues. They are struggling in terms of vocation promotion and some orders have left vocation promotion behind completely. Life in community settings is “varied,” ranging from sisters living in large houses to some living on their own, usually for reasons of ministry or health. Sisters are actively engaged in social justice work. They often struggle to make ends meet. For all of this the Congregation praises them for their “dedicated and selfless” service. The report also candidly admits that the Visitation was met with “apprehension and suspicion” with some religious congregations refusing to “collaborate fully.” Some congregations, several sisters told me a few years ago, when asked to explain their “quality of life” simply mailed in a copy of their constitutions. At various points, the report urges sisters to look more deeply at their charisms (that is, the founding spirit of their orders), their community life, their prayer and their relationship with the church. It also notes Pope Francis has asked the Congregation to look at Mutuae Relationes, the document that governs relations between the Vatican and religious orders. But these kinds of encouragements are regularly offered to religious orders. And the revision of the Vatican document will affect all religious orders—men and women—and it is not a critique directed at American sisters specifically. After the “great pain” that this Visitation caused many sisters, the report is a positive document that praises the extraordinary contribution of women religious in this country. The Spirit has moved mountains! Deo Gratias! Thank you, Sisters. This is so heartening and well-deserved. But now I think it is the job of not just the sisters but the church as a whole to consider how to keep the charism and spirit that the sisters embody alive in new ways. It terrifies me that future generations may not have the same faith-instilling experiences with Catholic sisters that I have had, and I worry that this is a problem that many sisters' communities are not equipped to address on their own. It's a challenge for everyone. I'm inspired, for instance, by the ways in which young lay women like Karen Gargamelli and Marcia Lee are experimenting with new approaches to faithful community life—approaches that draw from the legacies of sisters while applying them to the needs of young people today. I hope that we don't take this report as a sign for complacency, but as a call to creativity. The picture for priests is not all that rosy either. More than 40% of US priests are over the age of 65. The US currently has almost 3500 parishes without a resident priest (it was 549 in 1964) in spite of the closing hundreds of parishes in recent years. Because vocations to the priesthood for US born Catholics are so low, the US church "imports"" priests from overseas - almost 20% of US priests are from overseas. There were 494 ordinations last years out of a reported Catholic population of 66 million, with about 31% of the new ordinands having been born overseas. The total number of priests (including overseas recruits) is 20,000 fewer than in 1965, although the Catholic population grew from 45 million to 66 million during the same time period. It is clear that there is relatively little interest in the Catholic priesthood on the part of young Catholic men. And if young men are not interested - why would young women be? At least priests enjoy a certain amount of "power" and prestige - even at the parish level. If they are ambitious and rise through the ranks, they gain even more power, as well as quite a few privileges and material perqs. Why would educated, intelligent young women today be interested in becoming a vowed religious in a church whose male leadership shows them little to no respect, one that demeans all women by officially teaching that women are second-class citizens of the church? Women can serve others as employees of non-profits, of Catholic schools and hospitals, and as volunteers for many organizations as well as volunteering as members of laity affiliated with orders, as lay members of communities that include particular charisms, community prayer and spiritual life etc, - without having to be vowed? You mention the financial assets of the LCWR orders. Most of the religious orders "investigated" were savvy enough to retain canon lawyers to advise them about how best to respond to the highly detailed and intrusive questions regarding their finances and assets. They did not have to respond to these invasive and detailed questions on their finances, and most did not. It seems that learning what the sisters are worth was of great importance to the men who have cost the church billions because of the failure of bishops to properly handle the cases of sexual abuse of the young by some of their priests, instead facilitating further crimes by hiding the known crimes and moving these sexual predators from parish to parish. Several dioceses in the US have declared bankruptcy, as you know. So it does seem as if it is at least possible that some of the men behind this "investigation" may have been interested in finding some reason to "take charge" of the assets of the sisters? The sisters will dispose of their own assets as they see fit and I trust them to use these assets for God's purposes far more than I do the men. It is up the LCWR to decide if any of the CMSWR orders have a similar charism and would continue the work they have been doing. Since the orders of CMSWR are not growing very quickly, and are very small, they cannot begin to take up the missions currently done by the LCWR. It could well be that the third orders or selected secular non-profits would be better equipped to continue their work than any of the CMSWR orders. However, one need not worry - the sisters are more than capable of figuring it out on their own. Regarding the relative growth rates of orders in the LCWR and CMSWR, note these facts from CARA:"One of the most striking findings regarding new entrants is that almost equal numbers of women have been attracted to institutes in both conferences [LCRW and CMSWR] in recent years. ".....CARA’s analysis of the ....data identified six religious institutes of women that have doubled their membership between 1970 and 2013. .... However, all six institutes together have increased their net membership by only 267 members since 1970, too few to have an effect on the overall picture. Whatever these institutes have done or are doing is unlikely to offset losses in the tens of thousands elsewhere. It is simply not enough." To Anne Chapman (not sure if this is your real name or a nom de plume?). I note the pattern of your comments across a variety of subjects and read a consistency of opinion, perhaps if you look at mine you may note a pattern?. Ordinarily, I would leave it as such. But I think that we all would benefit by taking the time to reevaluate our long-held opinions/prejudices and go beyond facile fixed positioning on issues that really matter in the life of the Church. Accordingly, I suggest that we both (and others as well) would benefit by reading the following article without prejudice or perhaps reading in to the page more than what is actually being said: http://www.ncregister.com/daily-news/the-visitations-phantom-issue-why-communities-thrive-or-decline/#ixzz3MI6yDefD In the end all that matters is that we stay faithful to Jesus teaching as handed on to us by his Church. William, I am belatedly catching up. I read the story at the link, but fail to see what you are attempting to draw attention to. The article does not say anything that has not been said by others, many times, and it continues to mislead as far as the real growth of the CMSWR orders - which is far too low to even begin to fill the gap that is being left by the LCWR orders, with an average of 4 new entrants/year for each order, not all of whom will stay to final vows. Perhaps you could help us discern the "more than what is actually being said". Perhaps also, everyone can think about whether or not the Holy Spirit may be at work in all of this (including in the dramatic decline in the numbers of priests), leading the way to a new model of being church - all of us - if we would only open our eyes to see. Thanks for reading it. As for your conclusion, you are old enough to form your own independent opinion. I wouldn't doubt for a minute that Jesus, the whole Trinity in fact, is constantly engaged with such affairs that are so important to his body the Catholic Church. As for repetitive statements (much like Mass Homilies), it can be hard work to listen. Unfortunately a problem I have had all my life... Merry Christmas and a blessed Feast of St Stephen! Yes, it can indeed be hard work to listen, especially to the Holy Spirit, who speaks in the breeze, rather than shouting from behind Vatican and chancery walls. I am indeed old enough to form my own conclusions. I form them after a great deal of study and reflection, trying to learn as much as I can before reaching a conclusion. My conclusions are always open to change if that seems to be the right course. Is that also true of you? You have apparently decided that the way forward is for the LCWR to turn over their assets to the neo-traditional orders. But you need to trust that the sisters are fully able to decide for themselves. It seems unlikely that the neo-traditional orders are either qualified for or even interested in taking over the work done by the LCWR orders as, they usually have very different charisms. Those who seek the old-fashioned form of community life, who wish to differentiate themselves from "ordinary" people by wearing habits, etc have a different charism than those who choose to live with those to whom they minister, wearing the same clothing (the habits originally were the same kind of clothing as those with whom the women religious worked in the 19th and earlier centuries), living in the same neighborhoods, rather than living behind a convent wall. The LCWR orders have worked out how to keep their sisters connected, part of the community of sisters, even though their ways may not be the way other orders have chosen. Two different calls, two different ways to serve. The LCWR orders may need to merge some orders, or they may need to find successors who will continue the work they do, in the way that they have discerned is best for their particular missions, working with fewer sisters than in earlier eras, but with them nonetheless. This may very well be through the extensive and growing networks they have established with lay associates. The other orders will discern their own paths, and one hopes that they are fully able to attract the funds they need to do whatever work they feel called to without depending on a legacy from the LCWR orders. Peace to you also. Is your comment relevant to the discussion about the long-term outlook for the religious orders pf the LCWR? The article is about the outcome of the "investigation" that was instigated against the religious orders affiliated with LCWR. You suggested that the orders belonging to the LCWR should consider giving their financial assets to orders belonging to the CMSWR, implying that those orders are growing at a much faster pace than is the reality. When given the correct figures from a report done by the Center for Applied Research in the Apostolate (CARA - a highly respected Catholic research institute), you than provided a link to a story that once again suggested (incorrectly) that the neo-traditional orders as a group are growing very quickly (most are not ), implying that going back to this model would essentially "save" the future of women's religious life in the future. Yet, at current rates, these orders combined will not even make a tiny dent as far as filling the gap that will be left as the older sisters die. I suggested possible alternatives to handing over the assets of the LCWR orders to neo-traditional orders. But I trust the LCWR orders to make their own decisions. Now you bring up Authority, the Magisterium, the Council of Trent - why? - these topics have nothing to do with the issue under discussion that I can see. These issues include correctly facing certain realities related to women's religious orders using reliable studies done by CARA. The reality is that the LCWR orders are not attracting many new applicants, and another reality is that the vast majoirty of the neo-traditional orders are not attracting many applicants. In the study done by CARA, the new postulants were evenly split between LCWR and CMSWR orders. Given the real numbers, it is clear that the neo-traditional orders are not attracting nearly enough new sisters to even begin to take over the ministries currently done by women belonging to LCWR orders. What then? Turn the financial assets over to CMCWR orders that do not share either the charisms or the ministries of LCWR orders, or find alternative ways to carry on the work, perhaps through continuing to evolve the growing collaboration between the vowed sisters and their lay associates? Apparently you have decided to turn your comments into a personal diatribe against me, rather than discuss the issues. You have also reached several conclusions about me without any factual information at all. This is much like your apparent disinterest in the facts regarding the LCWR and the CMSWR - it seems that you prefer to reach your own conclusions, whether those conclusions are supported by facts or not. You are the person who raised the issue of the LCWR turning over their "considerable assets" to the CMSWR - I pray that as these large Congregations implode due to mortality they look to sharing their considerable assets with newer ones. I think that the LCWR should seriously consider merging with CMSWR and creating an entirely new leadership conference. You do realize, as do all those who have studied this issue in anything beyond a surface way, that there was only one conference - until some orders decided to form their own in 1992 - the CMSWR. It seems unlikely that they will wish to form a single conference again.For the Church is much more than an a venerable do-gooder organization. The Pope talks about misunderstanding the Church and thinking it to be an NGO. The Church is not an NGO.Who said the church is an NGO? I didn't, so why did you make this comment? Please do not put words in my mouth. I did at one time suggest that it may be better to turn over some of the mission to secular organizations who are engaged in the same work than to turn over their assets to religious orders who are not engaged in the same type of mission nor have the same charism. But it is unlikely the sisters would have to do that. It is far more likely that they will continue to evolve the lay associates and third orders to work with them in their mission areas. 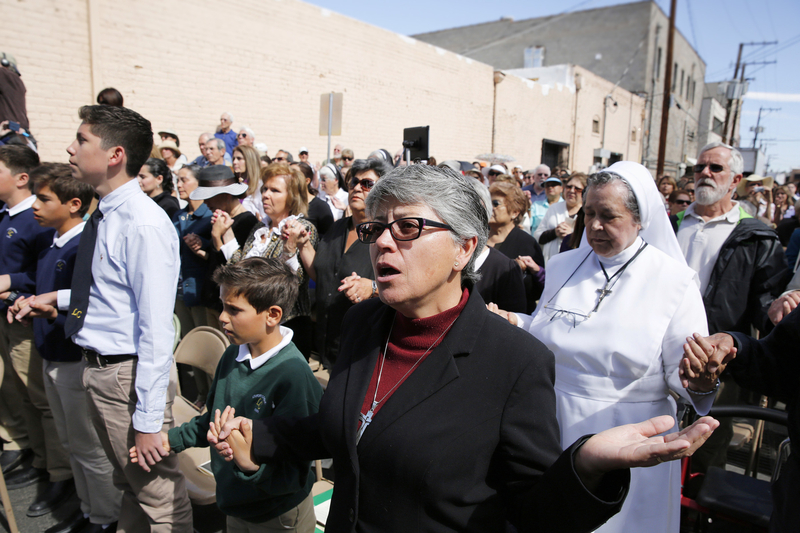 There are also numerous Catholic organizations engaged in much of the same kind of ministries as many of the LCWR orders, who could also become partners with some religious orders as their numbers decline. You have concluded that I am not a Catholic - which is not only a conclusion unsupported by any factual information, it does not even make logical sense. Do you seriously think that someone who is not a "baptized Roman Catholic" would be even slightly interested in this particular controversy? It is not a good idea to base conclusions on your personal impressions rather than on fact. You apparently believe that I am not Catholic because I don't agree with you on your recommendation that the LCWR orders turn over assets to CMSWR orders. However, if any doubts remain, I can reassure you that I most definitely understand the "RC paradigm". Since the Visitation was announced, I have felt that the good Sisters, a safe bet, were being used as a scapegoat, a diversion, or a smokescreen to the real problems facing the priesthood. When you've got a stinking mess in the basement, let's go witch hunting in the attic. The Sisters were doing wonderful work caring for those in need while too many priests were assuming worldly perks for their service. I am heartened to see this glowing report & saddened that the Sisters were caused additional anxiety. Now let the broom really sweep clean.